There are special toys of what might be thought of as sensorial puzzles in the Montessori school to isolate and teach specific concepts through repeated individual work of the child. A few examples you may have heard of include the pink tower, the color tablets, and the sound boxes... These sensorial materials have no place in the home. - Child of the World. Montessori, Global Education for Age 3-12+. Susan Mayclin Stephenson. Susan has a point. She continues to say that Montessori sensorial materials should only be used as intended, not as the child pleases and that parents can keep the lessons and play with the child in ways she mentions further. The whole concept of using Montessori materials at home has been a puzzle to me until now. It is impossible to think we can create a Montessori school at home. It is impossible to have the same knowledge as someone who is trained, it is impossible to create the same environment. There isn't any need to. At home we share many of the experiences Susan lists (playing with blocks, gardening, woodwork, baking). But we also have some toys that while they don't replace the Montessori materials they do represent a sensorial lesson. Nesting or stacking boxes. I have shown these before, the difference is now Otis is using them all by himself. Puzzles. Also Otis is using the Rainbow Stacking Tower. 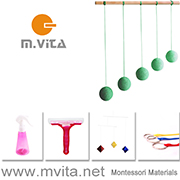 Have you ever thought you needed to purchase (or make) specific Montessori marterials? Perhaps think again. Montessori in the home - really! Dear Readers, This is an entry from 2011 that I liked so much I wanted to share it again with you today. The photograph is recent, a collection of items from Otis's messenger bag. I feel that a positive home environment should come naturally. However in our home it is something I reassess frequently. I strive for a home that is not too serious and is filled with joy and playfulness. Remember this needs to be genuine, we can provide this stable environment even in times of stress. This is on the list because it is something I struggle with. Montessori once said that interrupting a child is one of the most harmful forms of repressive action we can take. At school, at home, doing puzzles or just putting on shoes - allow the child to concentrate, don't interrupt. Once I stopped interrupting Caspar I realised that most of the interruptions were completely unnecessary, unhelpful and didn't contribute towards him completing the task.